I needed to paint something that reminded me of a warm summer day. I am so ready for winter to be over. This is 6x6 on 3/8" panel. It has a special hole drilled in the back so this can be hung without a frame if you want. How I long for warmer weather also! Today it is minus 26 degrees C. where I live! 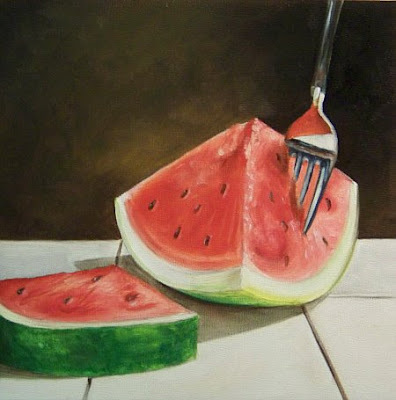 This is a lovely painting - the watermelon is lovely and transparent, and the fork is wonderful with the reflective surface so well done. :-) Thanks for the reminder that eventually, summer will arrive!